Radiant in-floor heating is increasingly popular for the dual reasons of unmatched comfort and efficiency. Our cross-linked polyethylene (PEX) pipe is easy to install in a concrete floor slab in the basement, for slab-on-grade foundations or within a 2” concrete pour over plywood on additional stories. Ideal for the researched do-it-yourselfer, we provide this piping and the necessary manifold at a discount to typical retail pricing. 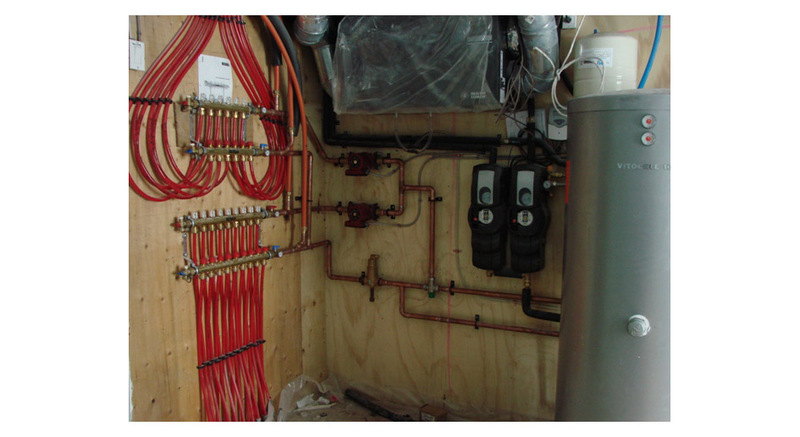 With the plans for your building, together with notations regarding insulation levels, window types and sizes, and geographic location, we can determine your heat loss, generate a map of the ideal layout of the hydronic pipes and supply the piping and manifold for direct connection to your plumbing system. Need complete heating and ventilation plans for your new home permit? We can generate those too, as part of our design and consultation services.